After much anticipation………Opera After Dark is back with a second season! Today’s episode features a fantasy opera casting of Outlander, which is TV show based off of the book series by Diana Gabaldon. 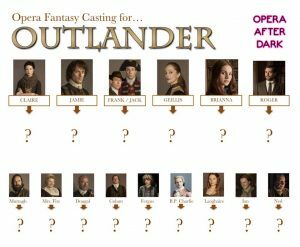 If you aren’t one of the seven people in this world that follow both opera and Outlander, you can enjoy hearing us gush about our favorite opera stars and shaming each other’s casting decisions. Be sure to subscribe so you can catch new episodes as they come out each week!